Demonstrators in Hong Kong, October 2014. Photo by 香港獨立媒體網, used with permission. This article was written in Chinese by Keyboard Warrior, a civic group advocating for Internet openness. It was originally published on inmediahk.net on Oct. 20. This version was translated into English by Andy Mok from Facebook Group HKDemNow and edited for context by Oiwan Lam. A 23-year-old netizen was arrested for organizing a protest on Hong Kong’s Golden Forum, one of the city’s most popular online platforms. Police say he will be charged with “accessing a computer with criminal or dishonest intent,” an offense listed under section 161 of Hong Kong’s Crimes Ordinance (similar to a criminal code). On Golden Forum, the young man urged others to participate in a series of protests connected with the Umbrella Revolution from October 17 – 19. Late on the evening of October 18, a violent confrontation between the police and protesters took place in Mongkok, leaving more than a dozen people injured. Police arrested the netizen in his apartment early the next morning. (d) with a dishonest intent to cause loss to another, whether on the same occasion as he obtains such access or on any future occasion, commits an offence and is liable on conviction upon indictment to imprisonment for 5 years. 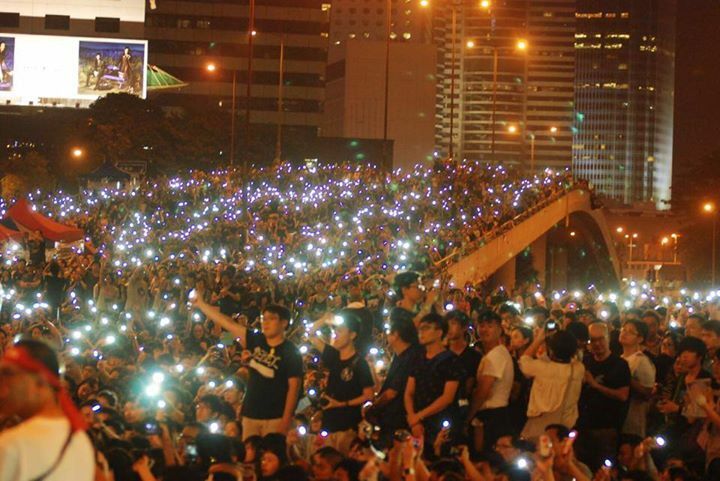 Since the beginning of the Umbrella Revolution, more than a dozen netizens in Hong Kong have been arrested and charged with “[accessing a] computer with criminal or dishonest intent.” Some of them allegedly participated in the Anonymous Asia's call for Denial-of-Service attack on Hong Kong government websites. The Section in question serves the purpose of stopping conduct involving “access to computer with criminal or dishonest intent,” such as internet fraud, hacking, or to commit other crimes via the use of a computer. The law thus is applicable to any crime in which the use of a computer is involved, thereby levying heavier sentences on individuals who may have used a computer in the course of committing a crime, even if their crime was in no way computer-specific. In recent years, law enforcement appears to have abused the computer crime law by attaching the charge of “access to computer with criminal or dishonest intention” to all other criminal offences whenever the use of computer is involved. If an act is criminal in nature, it should be prosecuted according to the Criminal Ordinance, rather than resorting to section 161. When commenting on the recent arrest of netizen for accessing computer to call for “illegal assembly”, Hong Kong lawmaker Charles Mok said he believed that law enforcement has abused the computer crime law. “It is like a universal plug that can be attached to all kinds of crimes if the act involves the use of computers, mobile phones or even digital cameras.” He urged the law be amended to prevent its abuse. Police are legally required to obtain IP information from Internet service providers or online platforms before they take action to arrest netizens under the computer crime law. According to the latest transparency report released by the Journalism and Media Studies Centre of The University of Hong Kong, Hong Kong government made a total of 5,511 user information requests (requests for users’ contact information, IP address, etc), out of which 3,846 requests (70%) were granted in 2013. The majority of these requests were made without a court order. Netizens who use these services are not informed of company protocols when their data is requested by law enforcement. The above data was revealed during a question and answer session of the HK Legislative Council. Local ISPs and Internet platforms have not released transparency reports for the same period and have not indicated plans to do so. When confronted with the abusive use of the computer crime law, netizens are advised to exercise their “right to silence.” While laws like this one may have been developed to serve the public interest, they can become tools for political persecution if placed in the hands of a repressive regime.